Though there's a "fairly large number" of upheld charges, expert says, agency isn't sweeping problems under the rug. Steve Griffin | The Salt Lake Tribune Utah Highway Patrol Maj. Michael S. Rapich talks with reporters about Trooper Lisa Steed and a 2010 document that suggested that 11 of 20 arrests by Steed were falsified. Rapich spoke at UHP offices in Murray on Friday, Oct. 12, 2012. 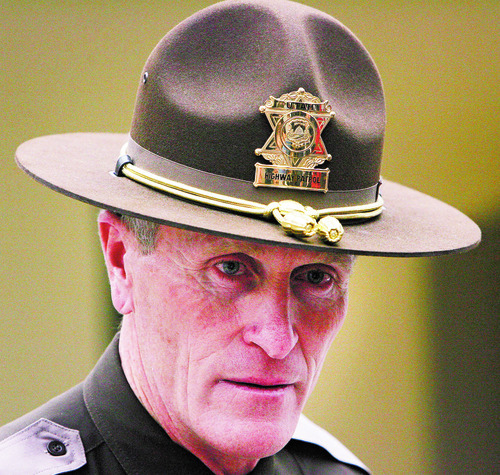 UHP on Dec. 5, 2012, released data on how many complaints it received against troopers. The UHP statistics show that the majority of complaints against troopers are found to be without merit. That&apos;s typical for police forces across the country. Samuel Walker, a professor emeritus of criminal justice at the University of Nebraska at Omaha, said it&apos;s difficult to compare rates of sustained complaints from one police force to another. Some police departments make it easier than others to file complaints or have more interaction with the public. Other factors, such as varying standards for what constitutes misconduct, also can influence the number of complaints. However, Walker wrote in an email to The Tribune, UHP appears to have a "fairly large number" of sustained allegations. That can be a good thing, he said. "Although we can&apos;t put this into any meaningful context, it does say that the agency is not sweeping them all under the rug," Walker wrote. The Tribune first asked for misconduct statistics in the summer. Utah Department of Public Safety spokesman Dwayne Baird said UHP had no such statistics. Then, in a written response to inquiries from the newspaper for an investigation published last month, UHP said providing such statistics is "a laborious but not impossible task." The Nov. 18 Tribune article raised questions about how UHP investigates misconduct allegations and reported that UHP did not have discipline data. In a Nov. 29 meeting with The Tribune, UHP Maj. Mike Rapich and Maj. Mike Kuehn said UHP tracks complaints and reviews statistics quarterly. On Thursday, Baird said he and a UHP attorney, Lana Taylor, did not previously know those statistics were compiled. In the Nov. 29 meeting, Rapich said UHP has a sergeant assigned to track complaints against troopers and to call on supervisors to ensure complaints are investigated. "We feel like we&apos;re extremely conscientious in following up on problems," Rapich said.